Rent Lockheart Gables | Corporate Events | Wedding Locations, Event Spaces and Party Venues. Lockheart Gables is a beautiful, intimate location that is the perfect facility for Dallas/Fort Worth area weddings. Included in each package is the honeymoon suite of your choice, as well as Lockheart Gables' minister, required for all ceremonies. Per Fort Worth City Ordinance, any DJ or Live Band MUST conclude by 10:00 pm. Once DJ or band is gone, a compatible device that accepts an earphone jack may be hooked up to our system for the remainder of your venue time. Acceptable devices include MP3 players, tablets, or computers. The playlist may include whatever the wedding couple desires and may be played until midnight. Since this location is in a residential area, the volume must be kept at a reasonable level. The Garden can accommodate up to 150 guests. 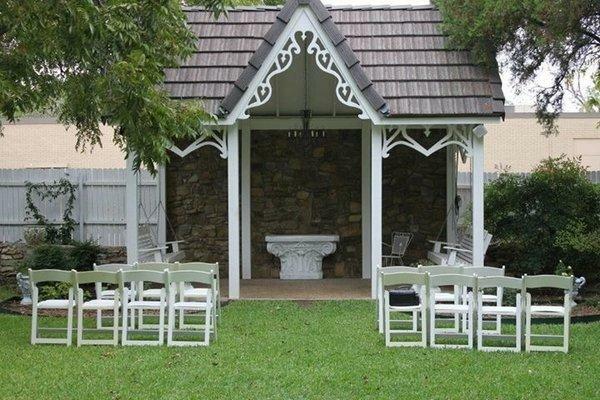 There are two venues in the Garden - our quaint and charming Gazebo, or our beautiful 4-level rock water feature surrounded by trees. Mother Nature does a great job of decorating the garden, leaving little decorating necessary! All suites at the B&B must be reserved for Friday or Saturday evening weddings (6 additional suites to the suite included in your wedding package), regardless of package. This provides the wedding exclusive use of the inn for a truly private event. Additionally, there is no end to the venue time when you have all rooms booked. For all weekday events in the garden, both Beloved and Sweetheart Cottages must be rented. This prevents guests from being forced to walk through your event to get or from to their suite. For all weekday events in the parlor/tea room, all inside suites must be reserved. This prevents guests from being forced to walk through your ceremony to get to or from their suite.